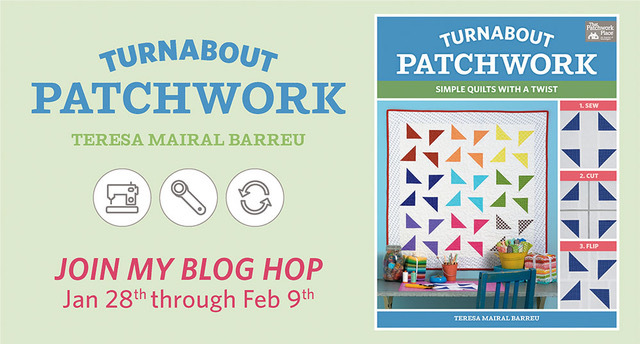 I am so excited to be part of the blog hop to promote Teresa Mairal Barreu’s fabulous new book, Turnabout Patchwork. The clear instructions and unpretentious style make this book a super beginner’s choice. Teresa’s playful approach to quilt design means it’s also an inspiring read for those of you who love to create your own unique projects. After reading this book, you will never look at quilt blocks in quite the same way again! One of the great things about Teresa’s sew, cut, twist approach is that you can apply it to so many different blocks, far beyond those covered in the book. Turnabout Patchwork contains an impressive number of projects but learning Teresa’s techniques opens up a limitless amount of design possibilities. When it came to choosing projects, I loved Teresa’s ‘Sweet Bows’ adaptation of the classic snowball block. These straightforward little blocks came together in no time. My version differs from Teresa’s as I emphasised the spinning pinwheel motif in the ‘Sweet Bows’ block. Mixing the clean colours of the quilting cottons with the texture of linen gave the pillow a vintage feel. If you follow this blog, you will know that I love that look! Four blocks were just perfect to make an 18″ cushion for an antique chair my husband picked up which he is inordinately proud of it! I quilted around the pinwheels and then added a wavy grid in a neutral thread over the entire cushion front to emphasise the movement in the blocks. I completed the pillow with a simple pieced envelope back closure. If you’re thinking I was a bit skimpy with the teal floral fabric, well I was as I love it so much and can’t bear the thought of running out. A mere pillow back did not seem worthy of a big strip of such a cherished print! I have a FREE pdf copy of Turnabout Patchwork to give away. To enter, add a comment below and one winner will be chosen by using The Eldest One as a random number generator. (He might be too sophisticated for such frivolity these days in which case one of the others will oblige.) Please make sure you include your email address in your comment so I can notify you if you are the lucky winner. You can purchase your copy of Turnabout Patchwork here. Do you enjoy traditional piecing? Do you have a favourite block? I’d love to hear your thoughts! Check out another version of Teresa’s cute ‘Sweet Bows’ quilt at Kate Colleran’s Seams like a dream. 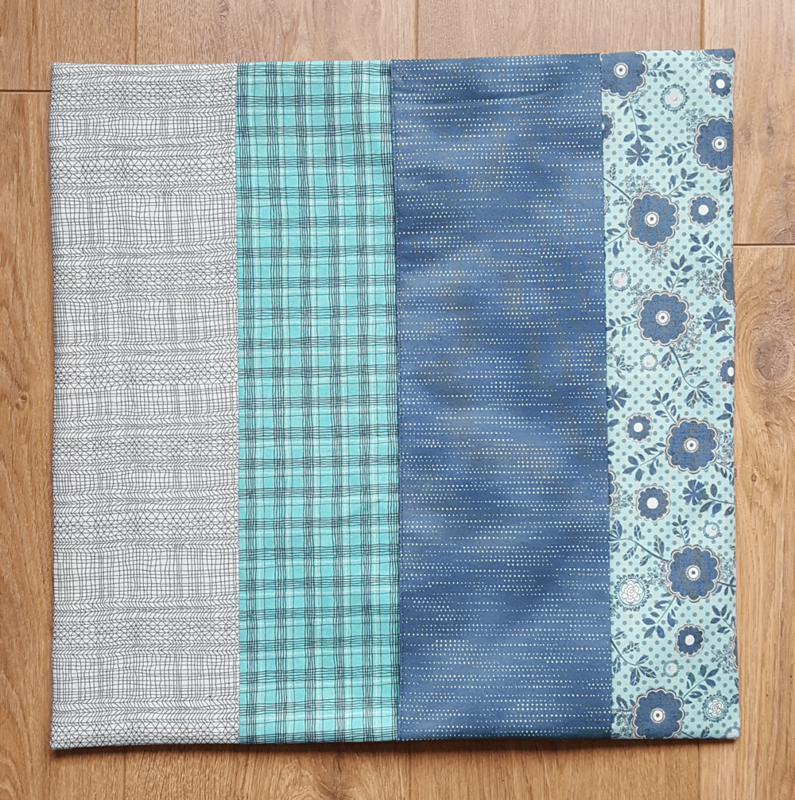 See more of the designs in Turnabout Patchwork by visiting the other stops on the blog hop, the full schedule is at the end of this post. Check out more pillow designs in my shop. If you wish to receive my blog posts or newsletter please sign up in the sidebar, I’d love to have you along! UPDATE: Congratulations, Rosalind! You were the winner of the copy of Turnabout Patchwork. I hope you love your new book! Love your pillow and this design, especially because when you put 4 together you get a larger block design in the middle. Thanks, Bambi! Good luck with the giveaway! Your pillow turned out beautifully!! I love piecing traditionally, and have several favorites. Sometimes, when I see a block I really like, I just go ahead and make it. I’m thinking I might do something with my samples some day!! Thanks for your kind words, Nancy! I love sampler quilts. My Mother made me one many years ago and that’s what got me into quilting in the first place! Thanks, and best of luck with the giveaway! Very cute! I understand about not wanting to run out of a favorite print — I have pieces like that too. If the fabric is still available sometimes I will buy more so I can use it without running out! I have done that too, Lisa Marie. I have a couple of yards of a navy stripe fabric which isn’t even that ‘Wow’, but it just seems to co-ordinate with nearly every project I sew and it’s great for binding also. I’m not sure I know that one, Karen. Thanks for stopping by, good luck with the giveaway! Cute pillow for that cool antique chair! I get that favorite print thing too; always sad to come to the end of a piece of fabric that has been fun to use and so easily used in many projects! I’m always sad when I run out of a piece that’s no longer available. Thanks, Wendy! We quilters do love our stashes! I keep every last tiny scrap of the prints I really love as they sometimes come in handy for paper piecing or appliqueing teeny details. Lovely pillow, I like the spinning wheel motion in the block…And your orchid is gorgeous! I like the spinning effect in your block as well, and your orchid is gorgeous! Thank you, Anita! The orchid has been in my studio for years now, thriving on neglect! Love the simplicity of this block with such stunning looks! Thanks very much, Kathy, for your kind words! I like your pillow. I found it interesting how the Sweet Bows pattern looks so different based on how you turn/color the block. Your and Kate Colleran’s use of the same pattern looks so different. Thanks, Donna! Fabric choices are such a massive part of the finished project. Good luck with the giveaway! Oh I love that pillow! I can see it done in seasonal fabrics too-lots of options! Oh I love that pillow! I can see it sewn up in seasonal fabrics for lots of options! Oh it would be gorgeous in seasonal fabrics! Great idea, Wanda! i hoard my favorite fabrics also, my favorite is the traditional friendship star. The friendship star is a sweet block and quick to sew too! Best of luck with the giveaway! I like the concept of Turnabout Patchwork. Your pillow is beautiful and I understand not wanting to use up all of a favorite piece of fabric. Maybe that is why I have such a large stash. Thanks, Marilyn, we quilters have deep bonds with our stashes. . . Thanks for popping over and good luck with the giveaway! I feel the project has to be worthy of my beautiful fabrics and quilt and pillow backs just don’t make the grade! Thanks for stopping by, Janet, good luck with the giveaway! Love your pillow. A block that looks more complicated than it is. Thanks, Donna! And you’re totally right, it’s a super easy block to sew! I’m fairly new to quilting, nly been doing it for about two years now. So I don’t have a favorite block yet because I’m having too much fun trying everything! Sounds great, Mindy! Good luck with the giveaway! I love your pillow. Such a great pattern from an old, familiar block. Thanks, Libby! It was fun to sew! I do enjoy traditional piecing and if I had to pick my favorite block it would probably be the log cabin. I love the log cabin with a fussy cut centre. There are so many gorgeous prints out there. Good luck with the giveaway! I love the Nine Patch blocks, they’re so great for using up scraps. And I do have many, many scraps! Love your color choices. I do enjoy traditional 1/4″ seam piecing, although I do alot of other things as well. Good luck with the competition, Laura, thanks for stopping by! I’ve only been quilting for a short time but reading the various blogs on Teresa’s blog tour is enlightening me to so many other quilters, their blogs and their work! Thanks for stopping by, Jeanette, I’m glad you’re enjoying the blog hop! I love this block and the book is so much fun, isn’t it. Doing one thing and turning it into another is a fun form of quilting magic. The book is great fun, Kathleen, it makes me look at quilt blocks differently and see so much more potential in simple pieced blocks. Thanks for stopping by! Thanks, Christi! I have never sewn a Granny square block but they look so cute. 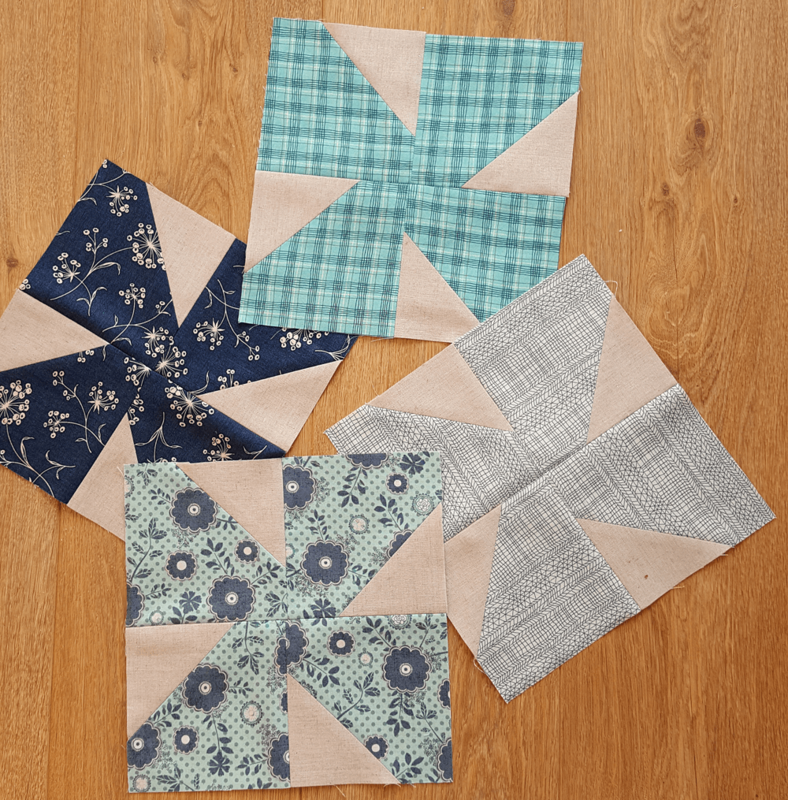 My favorite block right now is log cabin…love using those scraps!! Love your pillow! Thank you! I think I could sew daily for about a year and still be getting though my scrap pile. But obviously, that’s no reason to stop buying fabric! The book is super, isn’t it? I love some of the more complex quilts too. I like traditional piecing and I like crazy quilts to use up scraps. Crazy quilting is fun to do. Good luck with the giveaway, Sue! What a cute pillow. Simple block with stunning results! Thanks so much for your kind words, Deborah! nice pillow, I didn’t realize there was a middle pattern until I read the commetns! Thanks, Sharon, Teresa’s design is so clever, isn’t it? The classic nine patch is a fall back quilt block for me even done on point. Intrigued by the snowball spinning pinwheel idea. I love a scrappy nine patch block too. Good luck with the giveaway! Gosh I was just wondering what Sweet Bows would look like if I use a lights for the small triangles against darks! Thanks. Glad to be of help! Best of luck with the giveaway! Thanks, Danette, best of luck with the giveaway! I have a thing for the churn block–I can’t say why. Your pillow came out great! Thanks, Liz, I like the churn block too especially mini ones, they look so sweet. Thanks, Rita, good luck with the giveaway. This book looks like it has a lot of great ideas. I don’t have a favorite block…try to make every quilt a little bit different! I’m sure you’d love the book Dawn, good luck with the giveaway! Is your teal flower print from PB&J by Basic Grey? That was the only fat quarter bundle I ever asked for–I just love that collection! I didn’t realise that Beth but I googled it and yes, you’re right! I’m delighted to know the collection as I might find some more on a market site. I hadn’t seen the rest of the prints before and so many of them are gorgeous. What did you make with the bundle? Thanks for your kind words, Charlotte, good luck with the giveaway! That does look like a fun, quick block. Sometimes a quick project is just what you need! Thanks for stopping by. I have always loved making traditional blocks Cisco (Churn Dash, Shoo Fly, Ohio Star, etc.). I have been a fan of Teresa’s for several years and have made her Night Eyes quilt. It’s perfect for showing of large pieces of fabric. I am becoming addicted to slicing and flipping traditional blocks when I see the results such as your gorgeous pillow. It’s perfect! Thanks, Carol! I just had a look at the ‘Night Eyes’ quilt and it’s such a pretty design. I’m sure it was fun to sew. Good luck with the giveaway! Thank you, Susan! Best of luck with the giveaway! I really like the sweet bow block and the look so pretty in your cushion! Thanks for your lovely comments, Cynthia! I loved those fabrics. Can’t go wrong with blue and neutral color combo. 😉 Grat staging of your pillow. Absolutely, Joan! Good luck with the giveaway! I really like the way that you “turned about” your block! What a great secondary pattern it becomes when you do that! Thanks, Janette! It is fun playing with rotating blocks and different colour schemes. Best of luck with the giveaway! I love your pillow cushion for the new chair! I understand hoarding favorite fabrics! We quilters love our fabrics! Thanks for your kind comments, Judy. I love how these blocks look so different depending on how the various pieces are turned! Your pillow is beautiful! Thanks, Allison. I’m always amazed by how big an impact a small change in design can have. Good luck with the giveaway! I like the way your pillow finished. The colors are so nice. Thanks, Sue! I appreciate you stopping by. I love the ideas in this book and your pillow is adorable. Plus! … so many great new-to-me blogs to follow. Thanks, Sheila, glad to hear you’re enjoying the blog hop! Many thanks, Joan! I appreciate you stopping by! Thanks for participating in the blog hop. The pillow pattern is darling! Glad you like it, Janet, good luck with the giveaway! I Really like <3 your color selection for the fabrics and the quilting you chose is spot on for this pattern! Thanks, Willow, good luck with the giveaway!